Historically, non-cystic fibrosis (non-CF) bronchiectasis has attracted few advocates from the medical, pharmaceutical or broader community and has therefore been considered an orphan disease. More recent initiatives have substantially increased interest and research in non-CF bronchiectasis, leading to a strengthening evidence base for therapies and the development of a national bronchiectasis registry (https://lungfoundation.com.au/research/our-research/bronchiectasis). 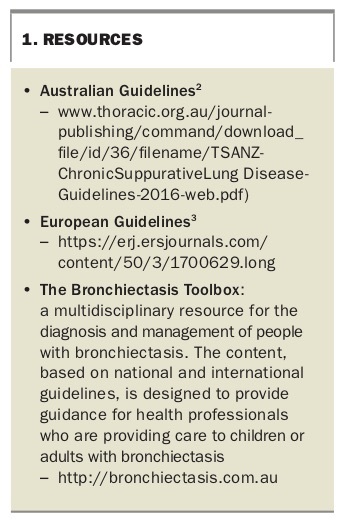 Guidance for health professionals who are providing care to children or adults with bronchiectasis is available in the form of Australian and international guidelines and other resources derived from them (Box 1).2,3 Seeking and confirming a diagnosis of bronchiectasis allows the provision of disease-appropriate treatment, with major potential benefit in both disease prognosis and quality of life for those with this condition. CF has an incidence of one in 2000 live births in Australia, and children with the condition are usually affected by bronchiectasis. A family history of bronchiectasis is therefore important, as CF, primary ciliary dyskinesia and Kartagener’s syndrome share an autosomal recessive inheritance pattern. Pathologically, bronchiectasis is a heterogeneous condition in which follicular, saccular and atelectatic histological patterns have been described.15 This pathological diversity may suggest that pathological bronchiectatic airway dilatation may be the final common pathway of several infective and immunological airway insults. The follicular pattern appears most frequently, usually involving the smaller airways. In the mildest forms, subepithelial lymphoid aggregations and oedema are the only findings.